In mitigation, you could say that the Connoisseurs Macaroni Cheese is okay. Just about. Perhaps a true connoisseur would eat it if the only other option was his own intestines baked in béchamel, but on the plus side, it isn't going to kill anyone. It doesn't glow in the dark. Neither does it have a peculiar whiff of chemicals or an inappropriately sweet perfume, like some of the other stuff on the table. The pink layers of meat on this pastrami sandwich, for example. Why do they taste so weird? And why are the slices of meat so densely textured and compressed, as if a heifer had just sat on them? While we're on the subject, this bowl of New England clam chowder is a disgrace; six woebegone clams in an over-salted silt of cream and potato do not a chowder make. Louisiana crab cakes with mango salsa and spinach salad? Sounds good, but they turn out to be revolting, deep-fried patties of indistinguishable seafood with a curiously minced texture. Don't insult me. I'm not eating those, either. Perhaps a drink, maybe a nice cocktail to cheer ourselves up? Let's try a Dime Store, an espresso martini with butterscotch, garnished with a "cracked" Dime chocolate bar. Very trailer trash and very apt, given the circumstances. I like it! Except I don't. Served in a tiny saucer glass that might make the shortlist for the smallest, meanest cocktail in the world competition, the £7.30 drink tastes bitter and unbalanced, with the Dime bar element provided by some scrapings of solids on top. What are they? In the night-light gloom, they look like pencil shavings. Or maybe something that's fallen off the walls? Anything's possible in here. Half an hour ago, someone smashed a heavy glass ashtray on the floor, scattering jagged shards down a low-lit passageway and under tables where diners were eating. It's dangerous, obviously. We've politely pointed it out at least six times to waiting staff, but no one's quite managed to do anything about it because they're too busy ferrying bowls of pasty, underdone shoe-string fries to unsuspecting customers. Just leave it, duderino, says S. Let's rent some shoes and go bowling instead. Apparently, tenpin bowling has apparently undergone a renaissance in this country, relaunched as "boutique bowling", with gourmet eats and drinks replacing the Slush Puppies and nuked cheesy chips of yesteryear. At All Star Lanes in London's Bloomsbury, four bowling lanes plus a laneside restaurant and bar have been carved out of a subterranean space beneath a redeveloped office block. The men behind the scheme also own a fashionable bar in Notting Hill and their investors include the Goldsmith family. Apparently more than £2 million went on fitting out this particular venue, but it's hard to see where the money has been spent. Holy skittles, I think to myself, if Zac's so keen on the environment, why doesn't he do something about this one? It's tacky in the extreme, with bowling lanes lined with linoleum, dining booths upholstered with creepy plastic stuff and a general ambience that suggests every expense has been spared. Perhaps it's different in the All Star Lanes private room, which can be hired out for £300 per hour, complete with its own two bowling lanes. One is named after Zac's aristocratic mother. Someone out there might want to make a joke about rolling big balls up Lady Annabel's alley, but it certainly won't be me. Meanwhile, back at the table, the American-themed menu is bowling dud after dud and gutterball after gutterball in our direction, while the wine list features only New World bottles of no great distinction. The cheapest are the King Fish Chardonnay and Cabernet Sauvignon (each £16 per bottle). These have an interesting mouth-puckering quality, but my lips are so firmly pursed after sampling the overcooked chargrilled tuna loin that it is irrelevant. A scrappy sirloin steak tastes claggy and smarmy, as if it has been stored in vegetable, as opposed to olive, oil. In addition, it is sliced so thinly that asking how customers want it cooked is irrelevant; at this depth, it's always going to be well done, and I don't mean that in the positive literal sense. The listing of lobster sandwiches, lobster salads and chargrilled lobsters may at first seem to give the All Star menu some of the gourmet cachet the owners are so obviously and desperately grasping for, but what they actually appear to be selling are those tasteless Canadian imports that are overpriced at any price, particularly at £30 each. Our version is weeping with salt and highly unpleasant, like everything else we order here. Even the cheeseburger - a weird bit of minced beef ham-fistedly shaped into an ovoid, slapped between the papery, dry lips of a long-life bun - is appalling. Puddings? Are you kidding? I've sampled enough stuff from this kitchen to last a lifetime and now, like S's hero, Fred Flintstone, I just want to live to bowl another day. However, what is so upsetting about All Star Lanes is that it doesn't have to be so crushingly bad, even if, in retrospect, I am grateful for the mean portions. The owners and investors are obviously angling after the youth market, and it always seems to be kids and young adults who are such easy prey in ventures such as this. They are the ones who can least afford it, and they deserve better. American diner food has an honour, integrity and appeal all of its own, but not if it is sloppily rendered using lots of cheap-tasting ingredients for maximum profit. Here, you don't have to bowl to eat, and you don't have to eat to bowl. Perhaps you wouldn't want to do either. 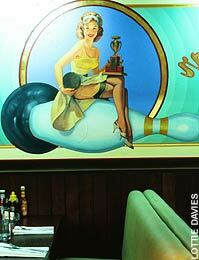 All Star Lanes, Victoria House, Bloomsbury Place, London WC1 (020 7025 2676). Dinner for two, excluding drinks and service, £60.